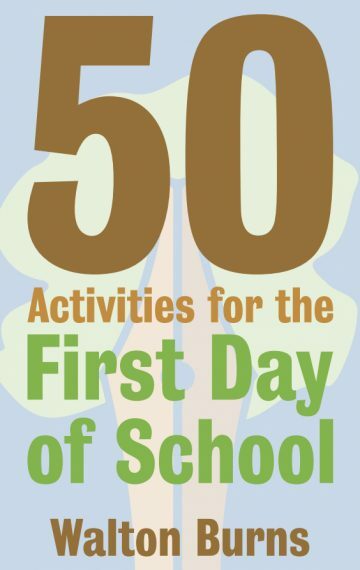 50 Activities For The First Day Of School, published by Alphabet Publishing, is, as the title suggests, a highly practical resource book for teachers looking for ways to add some variety to their first day activities. The author, Walton Burns, has created this ebook as a handy guide containing a variety of tasks mainly for lower level learners, although they are easily adaptable for all abilities and ages. In fact, one of the book’s main strengths is the flexibility the activities have, and it’s easy to imagine them being tweaked for use in any lesson. Walton starts with the most famous of first day activities, Getting To Know You. This is such a classic of English teaching, you could forgive him for a lack of originality. And while he does include familiar tasks like Find Someone Who…, he also includes more unusual tasks like Snowball Fight, where learners write questions and throw them around the classroom, and Time Capsule in which students leave messages for themselves to open at the end of the course (the version of this involving filming interviews with the students which they watch on the last day I found particularly interesting). As a result, I found this chapter to be full of great ideas, ready for use by teachers. The second chapter looks at Assessing and Evaluating, and includes ways of encouraging the students to produce in English with whatever they are able in order to allow the teacher to get a sense of their level. Personally, I’ve never done specific activities with this in mind, preferring to get a sense of the students’ level over time, but I enjoyed these tasks and I think they have a lot of potential, particularly with lower levels. The final chapter contains 6 activities for setting the tone in a course, a crucial and easily underestimated part of a first lesson. While I enjoyed the activities he included, I felt that this chapter could perhaps have been expanded to include a greater variety of tasks. This minor criticism aside, the book is a very good resource for teachers, particularly those in the first few years of their careers, looking to add some variety to their lessons. It’s always a good idea to have a suite of activities to rely on, but these tasks can easily become stale. Walton Burns book is a great help in keeping your first day activities fresh and motivating for your learners. The ebook is available here. It is accompanied by a support website containing online resources including printouts. Find out more about the author Walton Burns here.